Cupcakes are a universal favorite and the popularity of Gigi’s Cupcakes, the purveyor of delicious cupcakes this side of the world, is proof of it. These are easy to eat, thanks to their single-serving design, and easy on the eyes with their sweet toppings and fillings, from buttercream icing to fruit jam. But how do you eat them? Do you eat them as is, after peeling off the paper wrapper or do you eat them mashed together? No matter how you prefer eating them, you will be glad to know that there’s actually no right and wrong way to eat them. Here, we will take a look at the many ways that we can enjoy cupcakes, from the orthodox to the not-so-orthodox. Most people like to eat their cupcakes one bite at time and, thus, it’s considered as the classic – and classy – method. Yes, it can be relatively messy because there are no dining utensils involved but it has its merits, too. First, you can eat a cupcake anywhere, anytime because you only need your hands and mouth to enjoy it. Just hold the cupcake with your dominant hand, usually between your forefinger and thumb, with a light yet secure grasp. Peel off the paper wrapper and take a bite out of the cupcake. Second, you will get relatively equal amounts of the base cake, topping, and filling, if there’s any, of the cupcake with each bite. You are also maintaining the cupcake’s overall look and appreciate the artistry that comes with making it, from the outside to the inside. And it’s a method that works well for non-filled (i.e., no filling) and filled cupcakes. Babies will most likely prefer eating mashed cupcakes because these are easier to put into their mouth, savor and swallow. But even adults may find mashed cupcakes a joy to eat under certain circumstances, particularly when the cupcakes are too crumbly or their topping is too runny. In these cases, eating the cupcakes one at a time will result in a messy eating experience with more cupcake crumbs ending on the floor. Peel the cupcakes’ paper wrapper and place the cupcakes into an appropriately-sized bowl. Using a fork, mash the cupcakes until these are completely broken apart. Stir well to mix the crumbled cake pieces, filling, and frosting together. Add more frosting or jam to make a sticky, dough-like cupcake goodness. 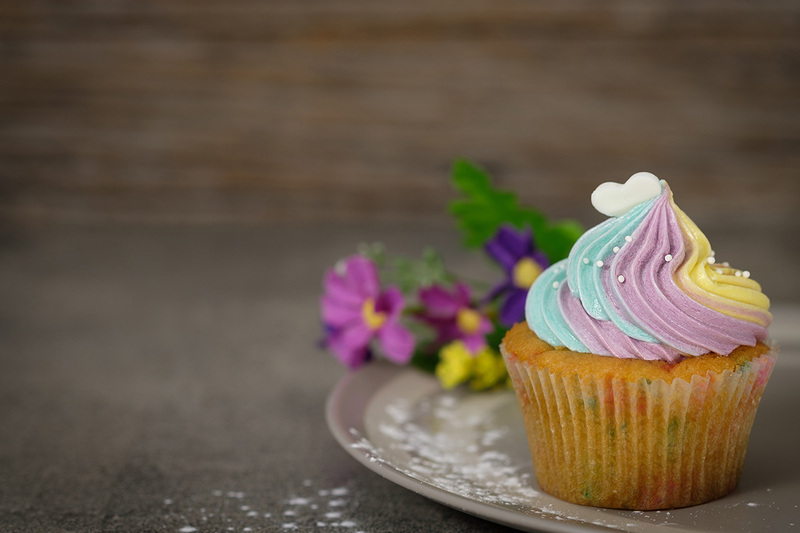 Frosted cupcakes without filling are good to eat as is, of course, but for more complexity of flavors, applying your favorite spread is a great idea. Just remember that this cupcake-eating method works best with non-filled cupcakes; filled cupcakes obviously have their filling so adding one more layer will change their overall taste, not to mention make them messier to eat. Peel off the paper wrapping on the cupcake. Using a dull kitchen knife or a plastic knife, divide the cupcake in half. Spread your favorite fruit jam, chocolate spread, hazelnut spread, or honey on the bottom half of the cupcake. Be sure to spread just the right amount so the “filling” doesn’t ooze out too much later on. Allow a few seconds for the cupcake to absorb some of the spread. Replace the top half of the cupcake over the bottom half. This method is similar to eating cupcakes like these were sandwiches although a preferred filling is first spread on the bottom half. Known as the hamburger style for obvious reasons, this method creates a more even ratio of cake to frosting, as well as makes it easier to eat cupcakes with less mess. Keep in mind, however, that it doesn’t work so well with filled cupcakes unless mess is on the cupcake-eating agenda. Peel off the paper wrapper on the cupcake. Using either plastic knife or a dull kitchen knife, cut the cupcake in half. Flip the top half of the cupcake (i.e., with the frosting) into its bottom half. Press gently so that the two halves meet nearly in the middle. The frosting shouldn’t ooze out too much lest it becomes messy. Eat like a sandwich, either with your hands or using a fork. Many people also like eating cupcakes by eating the parts separately, perhaps to enjoy the individual flavors of each part. Basically, the frosting will be eaten first and then the base cake next, a method that works well for people who don’t like mixing flavors. Again, there’s no right or wrong way to eat cupcakes – your cupcakes, your rules! But there are a few things to keep in mind when enjoying these sweet treats. You have to remember that while these are delicious, these are made of flour and sugar, two ingredients that can be fattening when consumed in large quantities. You have to practice moderation, a must with most things in life including food.